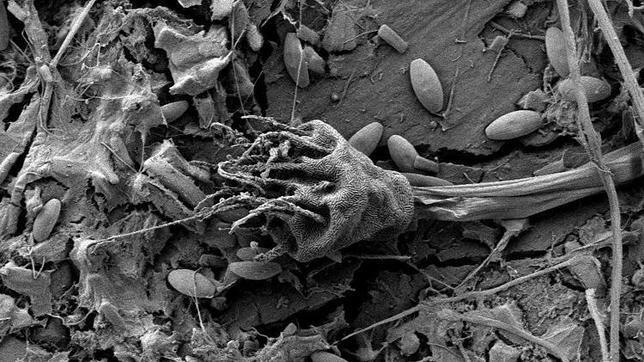 In a study recently published online in Environmental Science & Technology, the scientists say the plastisphere represents a novel ecological habitat in the ocean and raises a host of questions: How will it change environmental conditions for marine microbes, favoring some that compete with others? How will it change the overall ocean ecosystem and affect larger organisms? How will it change where microbes, including pathogens, will be transported in the ocean? The collaborative team of scientists—Erik Zettler from Sea Education Association (SEA), Tracy Mincer from Woods Hole Oceanographic Institution (WHOI), and Linda Amaral-Zettler from the Marine Biological Laboratory (MBL), all in Woods Hole, Mass.—analyzed marine plastic debris that was skimmed with fine-scale nets from the sea surface at several locations in the North Atlantic Ocean during SEA research cruises. Most were millimeter-sized fragments. Using scanning electron microscopy and gene sequencing techniques, they found at least 1000 different types of bacterial cells on the plastic samples, including many individual species yet to be identified. They included plants, algae, and bacteria that manufacture their own food (autotrophs), animals and bacteria that feed on them (heterotrophs), predators that feed on these, and other organisms that establish synergistic relationships (symbionts). These complex communities exist on plastic bits hardly bigger than the head of a pin, and they have arisen with the explosion of plastics in the oceans in the last 60 years. These communities are likely different from those that settle on naturally occurring floating material such as feathers, wood, and microalgae, because plastics offer different conditions, including the capacity to last much longer without degrading. This entry was posted in news and tagged microbes, plastic, plastisphere. Bookmark the permalink.